The cab of the new Stralis is designed around the driver. Class-leading ergonomics, comfort, safety and infotainment provide an optimum work environment that maximises productivity on every job. 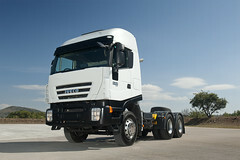 The new range offers a choice of three cabs – HI-WAY, HI-ROAD and HI-STREET.